According to Jonathan Waugh, department chair, Birmingham and the surrounding region are experiencing unprecedented demand for respiratory therapists and the time has never been better to pursue a career in the field. “A national shortage of respiratory therapists, combined with the increasing need to care for the aging population and the rapidly changing landscape of health care, creates a critical need for highly trained clinicians in this specialty,” said Waugh. 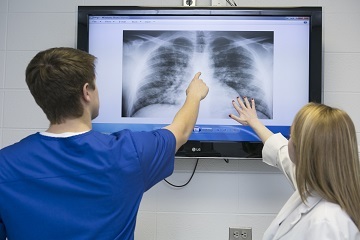 Both the Bachelor of Science in Respiratory Care and the Master of Science in Respiratory Care are entry to profession degrees that prepare graduates to take national board examinations in order to obtain a state license to practice immediately following graduation, Waugh said. The U.S. Bureau of Labor Statistics estimates that employment of respiratory therapists will grow by more than 12 percent from 2014 to 2024, faster than average for all occupations. Samford’s Master of Science in Respiratory Care is the only program of its kind in Alabama, and the bachelor’s degree program is one of only two in the state. Waugh cited a number of unique factors that set Samford’s program apart from others, including unique clinical and research experiences.